The Holy Martyress Felicita with her Seven Sons: Jannuarius, Felix, Philip, Sylvanus, Alexander, Vitalius and Marcial. Saint Felicita was born of a rich Roman family. Pagan priests made reports of denunciation against her for insulting the gods through spreading the Christian faith. 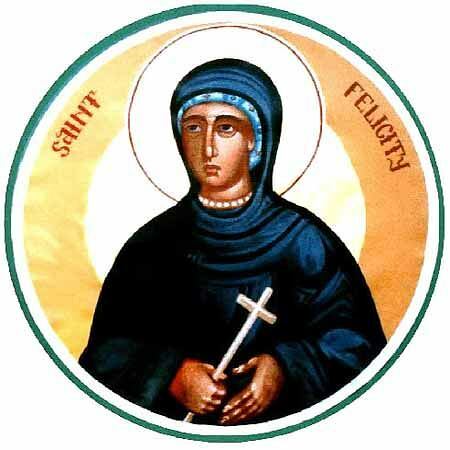 Saint Felicita gave off all her possessions, and together with her sons openly confessed faith in Christ. They were all handed over to torture. Saint Felicita, seeing the suffering of her sons, besought God, that they would stand firm and enter the Heavenly Kingdom before her. All the sons died as martyrs before the eyes of their mother. After them, Saint Felicita herself underwent a martyr's death. The holy family suffered at Rome in about the year 164. Sainted Gregory Dialogus gave a laudatory sermon for the Martyress Felicita in a third talk, preached in a church named for her.